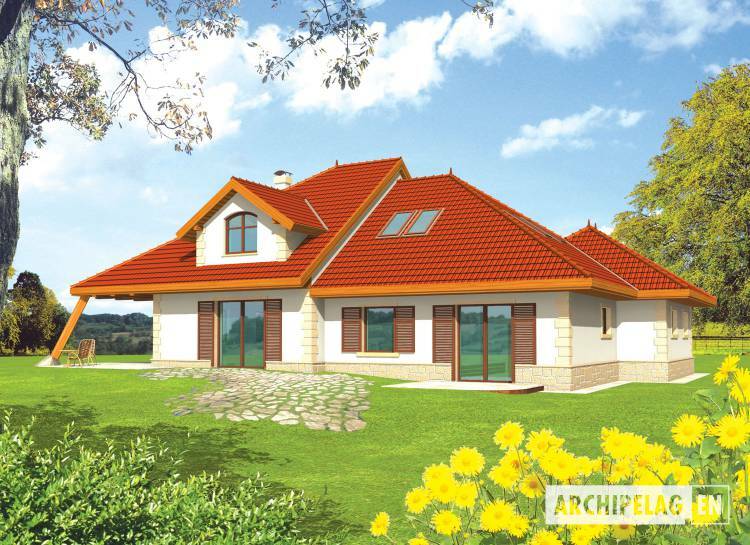 One-storey house with the functional attic without basement with built in 2stands garage intended for 4 - 5 - of personal family. The central entry home was underlined with little moving back the wall what created the arcade at the front door to the building. On the ground floor of the house a division into the daily and night zone was predicted. A daily zone is a spacious interior without clear divisions into individual rooms. Only centrally put stairs appoint the space. A utility room was planned by the garage it is possible to enter him from the vestibule and from the entrance hall. A study makes the night zone up (or room of the small child) and bedroom with the wardrobe and the separate bathroom. A big studio is located on an attic. It is possible also to distinguish two separate rooms from it. Remaining rooms of the attic are two rooms the bathroom and the wardrobe. A house in bricks technology with suspended beam and block floor. Internal wooden stairs. A roof of wooden structure tiled with ceramic. Facades made with structural plaster, plaster or siding plinth. Woodwork windows.